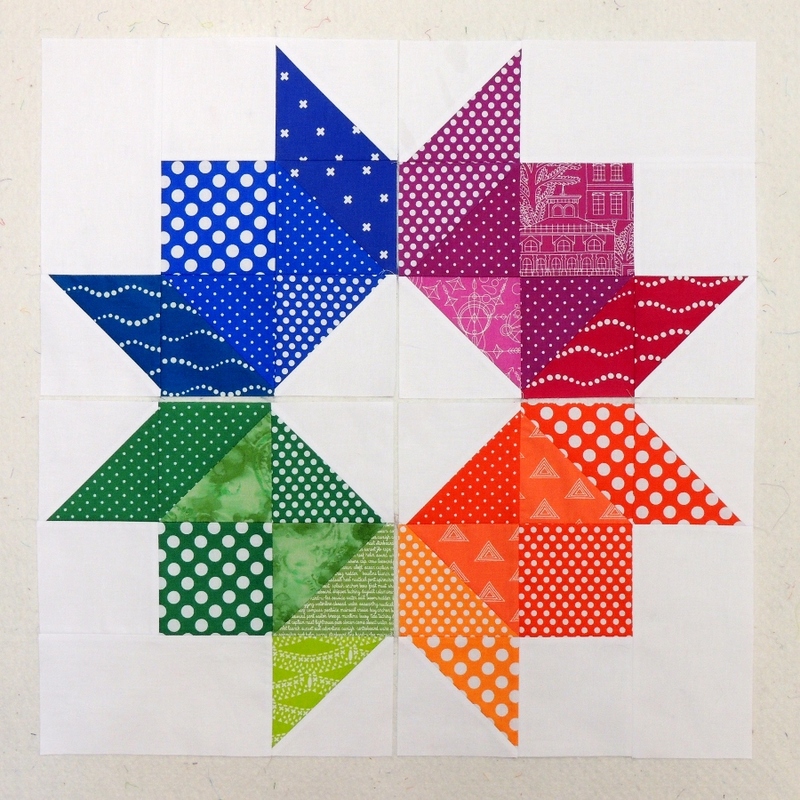 D’oh, I thought I would be posting just under the wire today to link up with Week 3 of the Rainbow Rose QAL, but the link up has already closed. That’s OK; hopefully I will be more timely for Week 4! 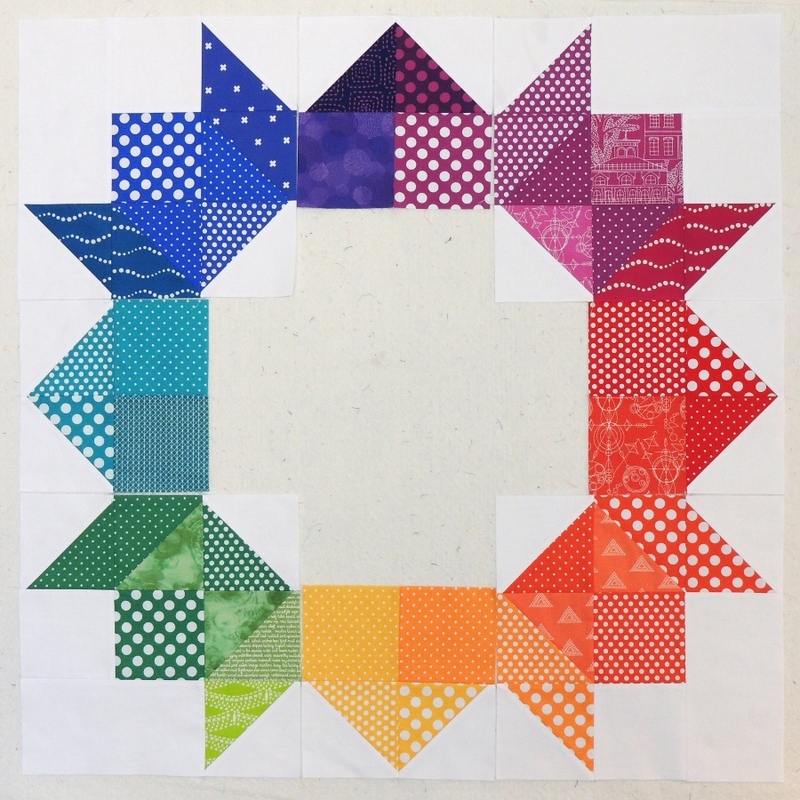 The goal for Week 3 was to create the corner blocks, and I first spent a lot of time curating the colors I would use in each corner… only to realize that I needed more colored fabric in each corner, so I used a bit of each of the last 5″ charm squares I had prepared! I really love how this is coming together, and each week’s instructions have been a perfect amount of work. Also, I am very pleased with how all the blocks are working together! I anticipate going back to my stash to get the center star colors to be a good transition; we’ll see! It’s looking really good Yvonne! learning a lot about color at the same time. I enjoy your comments and photos. Your transitions are very smooth, Ivonne, and the colors are so clear and bright, they just sing with all the white accents! Pity you didn’t manage to link up – everybody’s photos look so fun side by side, yours would have been a great addition. I am loving watching your progress every week, Yvonne! It makes me want to make this quilt STAT! Can’t wait to see where you go next week. Oooh these are so pretty! Great fabric choices and transitions! This is going to be such a beautiful quilt! Your fabric choices are spot on and of course…its rainbow! This is fabulous! I just thought the same thing Jayne said, your fabrics choices are spot on! This is going to be awesome!! Looks pretty perfect to me! I might keep this open beside me as inspiration while I try and fix my blue greens! This is looking good!. I may just have to start one too. It looks wonderful! You know me, I love all those bright colors – they are singing to me! 🙂 Great job! I love it. So colorful, makes me smile. Sorry you missed the deadline, but so glad you posted this! It’s absolutely gorgeous. Well worth the extra time you took to get those fabrics just right. those colour transitions are amazing Yvonne. This is looking great Yvonne – just heading down to finish my corners now! My artist daughter and I were discussing how many projects are being made using the rainbow! I love them. She also discussed the acronym ROY-G-BIV, which I had forgotten. Very nice! You have a great color transition for the rainbow. Your fabric colors are so rich and the transition from color to color is spot on. Too bad you missed the link-up. It’s going to be beautiful when it’s all done. Your quilt is looking so good. It is going to be amazing. It’s coming on so fast and looking beautifully crisp against the white.